Алексей Круглов и Круглый Бенд - "Russian Affair"
Альбом "Russian Affair" изданный лейблом АртБит, представляет импровизационную музыку с участием немецкой группы VocColours и российских музыкантов Алекеся Круглова, Романа Столяра, Олега Юданова и Андрея Разина. Tracks 1-3 were recorded on October 16, 2015 at The 4th Leo Records Festival in Russia at Cultural Centre Dom in Moscow by Maxim Khaikin. Mixed by Alexander Mikhlin. Track 4 was recorded on May 2, 2012 in Loft, Cologne, Germany by Stefan Deistler. Mixed by Stefan Deistler. of forms connecting classical and modern music, free-jazz and improv music. Special thanks to The Goethe Institut, Leo Feigin, Ramani Narayan and Andrei Gerasimenko! 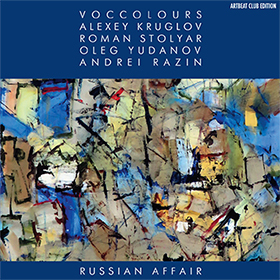 Special thanks from VocColours to Alexey Kruglov for organization and inviting the ensemble to perform at the Leo Records Festival in Russia!